Firstly, the length of time malt spends germinating is much longer than I previously thought. The longer the germination the more enzymes develop. 10 -11 days in Great Britain to produce a fully modified malt for single infusion mashes. 7-8 days for the less modified malts on the continent. Recommended germination temperatures 15-18 C for pale malts 20-25 C for dark malts. Modification continues even when the roots start to wither. So no need to keep spraying water to keep the roots healthy looking. You actually want growth to slow down. The most active growth period is from day 3 to day 6. The build up of CO2 will also slow growth without inhibiting enzyme development, so a box with a lid is a good idea although I wouldn’t recommend plastic as it may encourage mould to develop. The length of the acrospire is not a good way to judge the level of modification. Sometimes internal modification does not proceed as well as the growth of rootlets and acrospire. If this happens the temperature must be increased to 20-25 C even for pale malts. At higher temperatures roots can become tangled and matted together. When highly modified malts are required eg. Munich malt, the rootlets are allowed to become matted which makes turning difficult and a plow type tool must be used to break it apart. A better way to judge if the malt is modified is to observe the friability of the corn. To do this cut the barley corn along it’s length with a fingernail and rub between thumb and forfinger. If it spreads evenly and is relatively dry and chalky it is well modified. If not the contents of the corn roll into a ball between the fingers. Well it was supposed to be a porter but… maybe next time. O.G. 1.051 F.G. 1.013 Alcohol 5.03 % Final volume 3.75 but I can’t be exact because of the spill. Efficiency according to Brew Tools is 78%. That’s the technical analysis, as far as flavour goes- Wow, this is an awesome beer, I’ve never had anything remotely similar. It’s only flaw (besides not being darker, of course) would be that it could use more hops but this is a matter of opinion as this is my wife Lori’s favourite beer. She’s not a huge beer fan, most of the time when she tries a new brew she responds with “tastes like beer” but this has such a unique flavour it took us a while to pin it down. 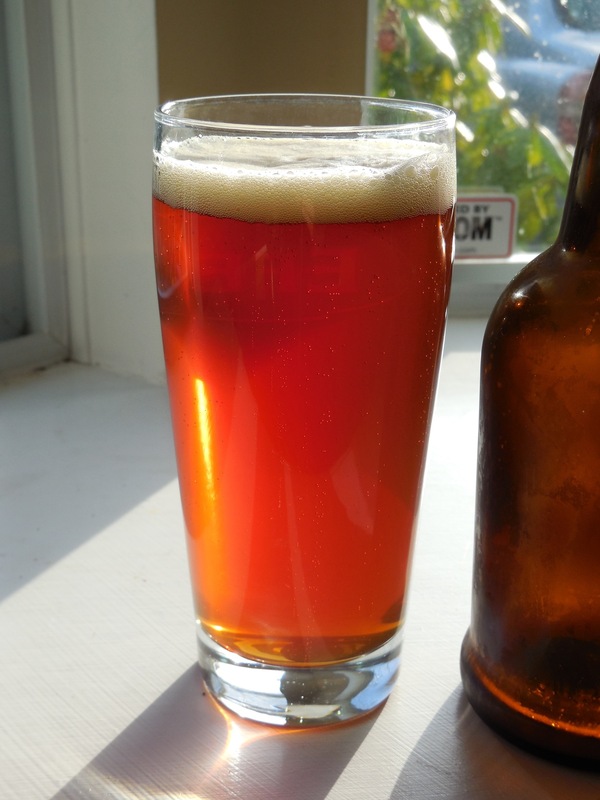 Clarity: Super clear but the colour is light, similar to a brown or even a pale ale. I know porters made with 100% diastatic brown malt were supposed to be lighter in colour but probably not this light. It might be more appropriate to call this a pre-industrial pale ale instead. I think it is worth some further experimentation to find out how dark I can go and how hot I can cure the malt without killing the enzymes. Perhaps I’ll make a chart that will include temperatures, kiln duration and extract potential. Aroma: Certain smells can trigger memories and this beer had us both feeling particularly nostalgic. What came to my mind was the smell of charred cedar burnt in a campfire on a beach here on the west coast, it made me think of all the times we’ve spent camping by the ocean. What came to Lori’s mind was the smell of the Drum tobacco I used to smoke 20 years ago when we first met, (but in a good way). I find that all smokey smells affect some primitive part of my brain, perhaps a part we share with bees who become docile when they come into contact with smoke. Or maybe they get nostalgic too. Flavour: Some sweetness, a low hop presence which I think is a shame because the pecan smoke flavour would go very well with a lot of hops. I’ll try brewing a pecan smoked IPA very soon. There is a subtle nuttiness and tartness which is part of the smoke flavour and there’s a hint of toasted grains. The smoke is mellow enough, to allow the sweet and toasty flavours to come through. This was a fun project but I’ve only scratched the surface, there will be many more attempts in the near future and I have much more research to do. Thanks to this beer I may be hooked on smoked malts. I’d like to try cherry, maple and oak as well.